Square D 3P 30A 240V Series 2 & 4 Twin Branch Fusible Panelboard Switch. Plug-On Design. Reconditioned with One Year Warranty. Use Edison Type ECNR 250V RK5 Fuses. Square D 3P 60A 240V Series 2 & 4 Twin Branch Fusible Panelboard Switch. Plug-On Design. Reconditioned with One Year Warranty. Use Edison Type ECNR 250V RK5 Fuses. Square D 3P 100A 240V Series 2 & 4 Twin Branch Fusible Panelboard Switch. Plug-On Design. Reconditioned with One Year Warranty. Use Edison Type ECNR 250V RK5 Fuses. Square D 3P 30A 600V Series 2 & 4 Twin Branch Fusible Panelboard Switch. Plug-On Design. Reconditioned with One Year Warranty. Use Edison Type ECSR 600V RK5 Fuses. Square D 3P 60A 600V Series 2 & 4 Twin Branch Fusible Panelboard Switch. Plug-On Design. Reconditioned with One Year Warranty. Use Edison Type ECSR 600V RK5 Fuses. Square D 3P 100A 600V Series 2 & 4 Twin Branch Fusible Panelboard Switch. Plug-On Design. Reconditioned with One Year Warranty. Use Type ECSR 600V RK5 Fuses. 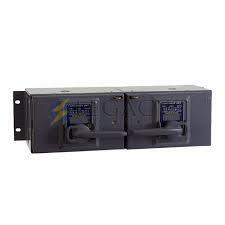 Square D 3P 200A 600V Series 2 & 4 Single Branch Fusible Panelboard Switch. Plug-On Design. Reconditioned with One Year Warranty. Use Type ECSR 600V RK5 Fuses. Square D 3P 30A 240V Series E1 Twin Branch Fusible Panelboard Switch. Plug-On Design. Reconditioned with One Year Warranty. Use Edison Type ECNR 250V RK5 Fuses. Square D 3P 60A 240V Series E1 Twin Branch Fusible Panelboard Switch. Plug-On Design. Reconditioned with One Year Warranty. Use Edison Type ECNR 250V RK5 Fuses.